I stumbled upon this draft registration card for my great-grandpa, Samuel Ernest Norris or “Doc” on Ancestry.com the other day. It’s pretty amazing in it’s own right just to see, but probably the coolest part for me is that it says he’s a Dental Student at Denver University in Denver, Colorado. Now, according to family lore he was a dental student in Boulder at The University of Colorado. Mysterious, right? So which is it? 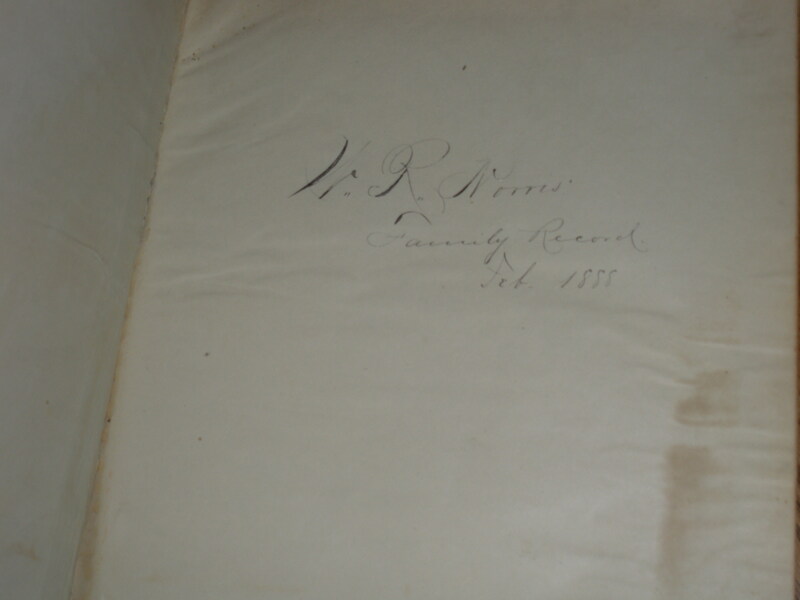 To close my Norris research for a little while, in order to spend some time tracing the remaining two branches, here (at long last) are photos of both Genevieve Paul’s Bible and William R. Norris’ Bible. Click on any of them for a better view. Note the witnesses to the wedding: Minnie’s parents and the pastor M.B. Wharton. Wharton, incidentally, is the middle name of William and Minnie’s first son Elmer (great-grandfather Samuel “Doc” E. Norris’ brother). This was something Mom caught the second time we looked over the names. One of the other things I’d like to know about the Bible is who wrote the entries. Are they in Minnie or William’s handwriting? I hope to find some of Minnie’s handwriting to compare. Aren’t these pages amazing, though? There are many pages just as intricately drawn as this one. Sadly, there are also places for family photos, but there aren’t any there. I’d love to see a photo of Minnie or William when they were younger; well William at any age actually. The Bible? Why had I never seen this Bible before. She gave such a mysterious and all-knowing persona to it. 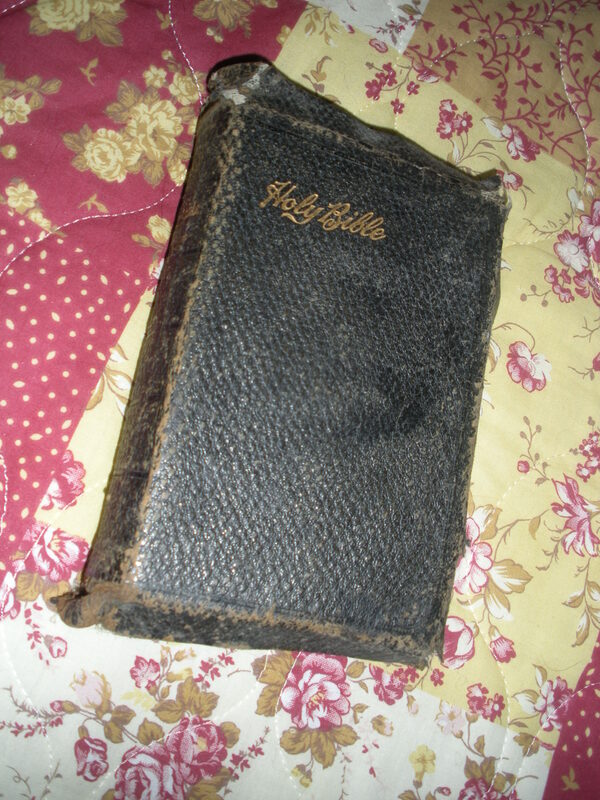 Every time I told mom about what I had or hadn’t found she would say, “I’ll have to dig out the Bible.” She never did. 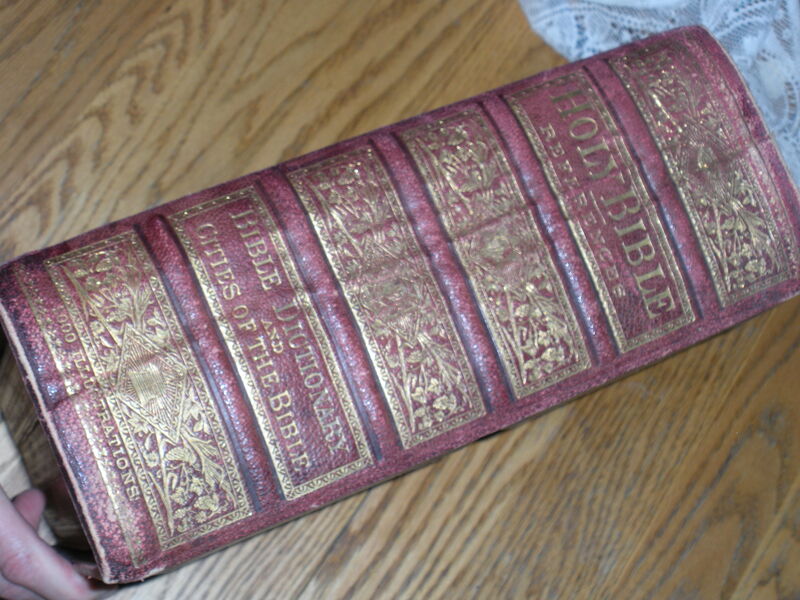 After my last post about so very many William Norris’ with none matching up quite right, I needed to see this Bible. My first impression was, “How intricate!” The cover is fantastic. The marriage page for William and Minnie is even more fantastic. 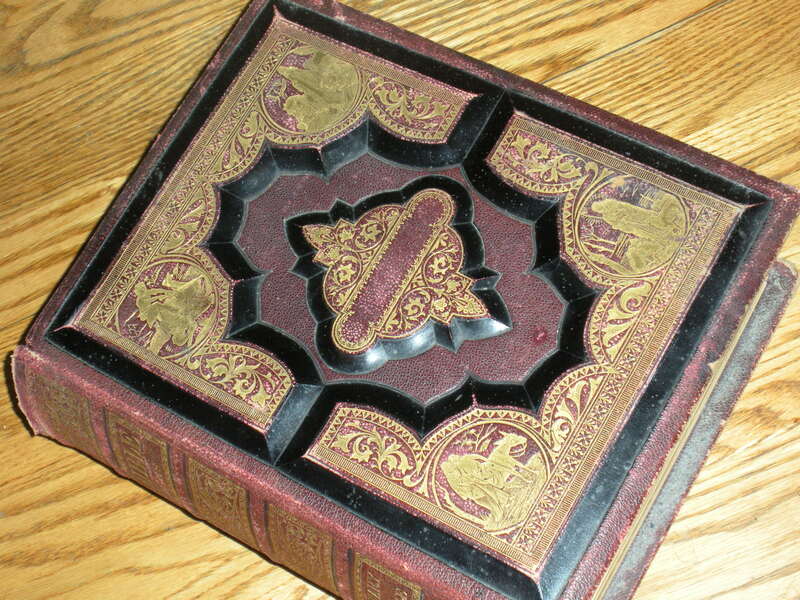 The information is written in beautiful calligraphy on an illuminated manuscript style page. These are the facts about their wedding that I summarized from the page. 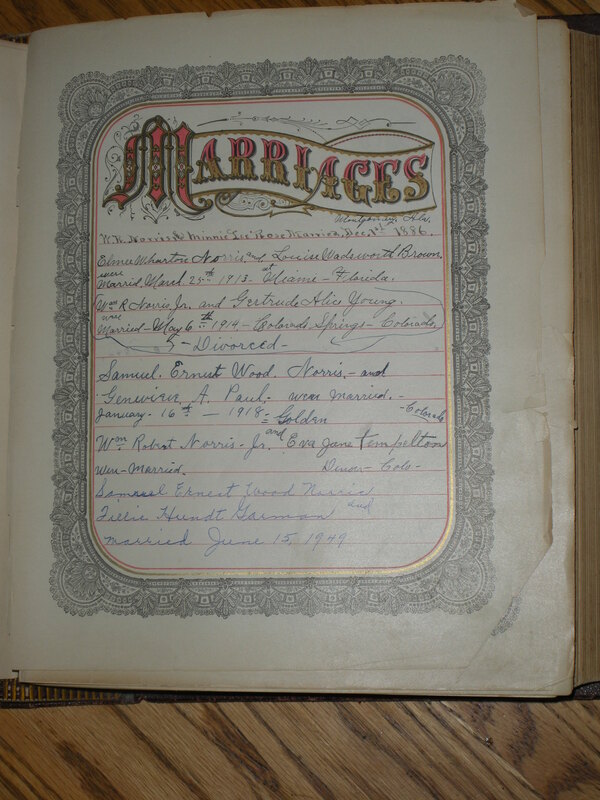 William R. Norris married Minnie Lee Rose in Montgomery, AL on Dec. 1, 1886 in the presence of S.L. Rose and S. Elizabeth Rose. 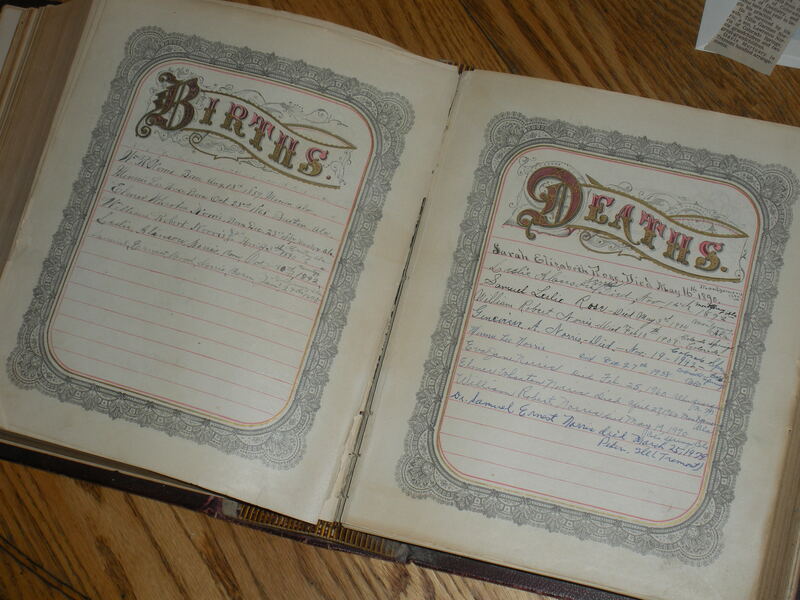 The next several pages listed births, deaths, and marriages. 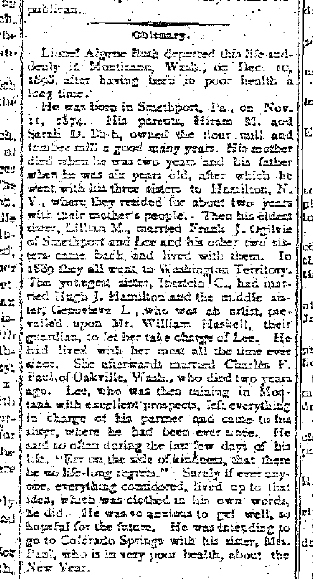 William and Minnie were there, along with my great-grandfather and his brothers Elmer and William Jr. and another brother who died as a baby. Here are a few dates, that I noted to begin with. There were additional dates that I didn’t include here, because I already knew them. There are many wedding dates too, which I’ll save for later. 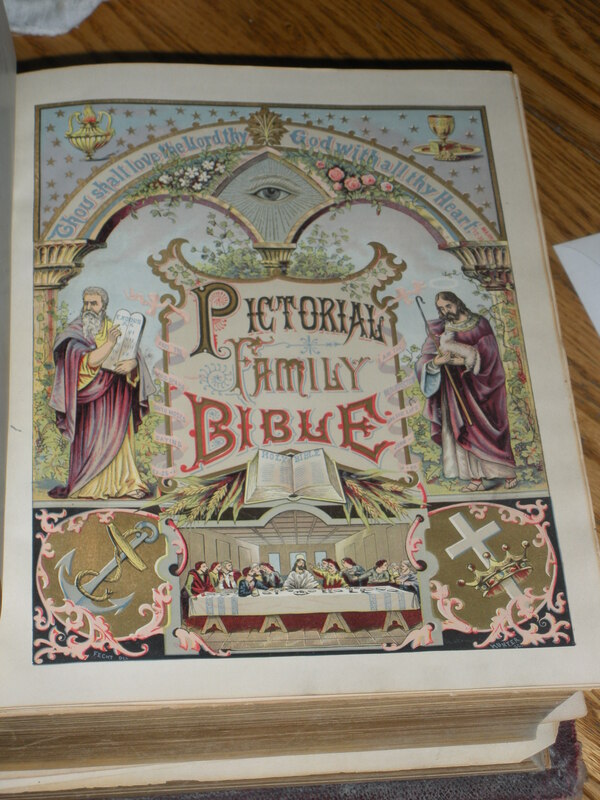 In addition to these amazing pages, the Norris family Bible also contained an envelope full of obituaries from various family members. Here, I found one for Minnie Lee Norris that stated that they’d moved to Colorado in 1904. That was definitely one of the questions in my mind. I knew they were in Alabama in 1900 and in Colorado in 1908 (the year William died), but I wasn’t sure when they’d moved. 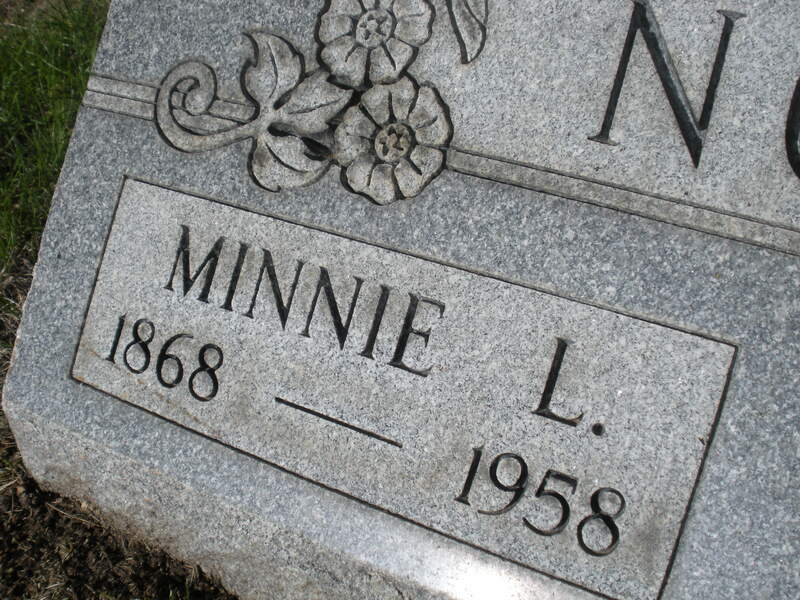 One of the other questions my aunt and mom had about Minnie was why she stayed here after William died. 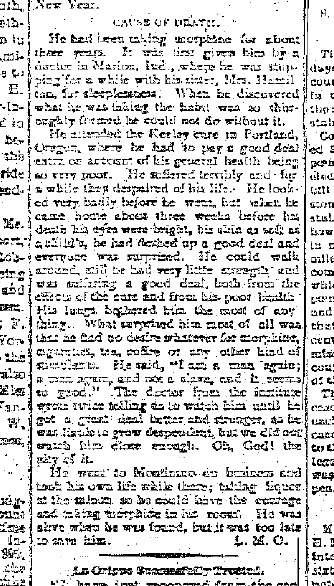 To our knowledge, they’d moved to Colorado (like so many) in hopes of curing William’s tuberculosis. They were here for four years before he passed away, which must’ve been long enough for the Norris’ to set down new roots. One of the things that we learned from the Bible entries was that both of Minnie’s parents died before she moved to Colorado with William and her boys. This could be one reason why she didn’t feel like returning to Alabama…or maybe she just liked it here. Overall though, the facts in the Bible were a little disappointing at first. Amazing as it was, it didn’t have the one piece of information I was looking for. Who was William’s father? He wasn’t mentioned anywhere… Or was he? In looking back over all of the entries, Mom and I noticed that the baby Norris who died within a year of being born had a very interesting name. Leslie…Alanson…Norris. The middle name Alanson couldn’t be a coincidence. It looks to me as if the baby was named after both Minnie and William’s fathers (Leslie being Minnie Lee’s father’s middle name, and Alanson being William’s father). This was a HUGE indicator that Alanson was indeed the father of the “right” William. The next big clue was that, according to the Bible, William was born in Marion, AL. Since I’d found the Alanson Norris family in the 1860 census (under A.B. Norris), in which that William was one year old, I guessed that the Norris’ would still live in the town where William had been born. If the town from that census record was Marion, AL, then I felt confident that Alanson/A.B. 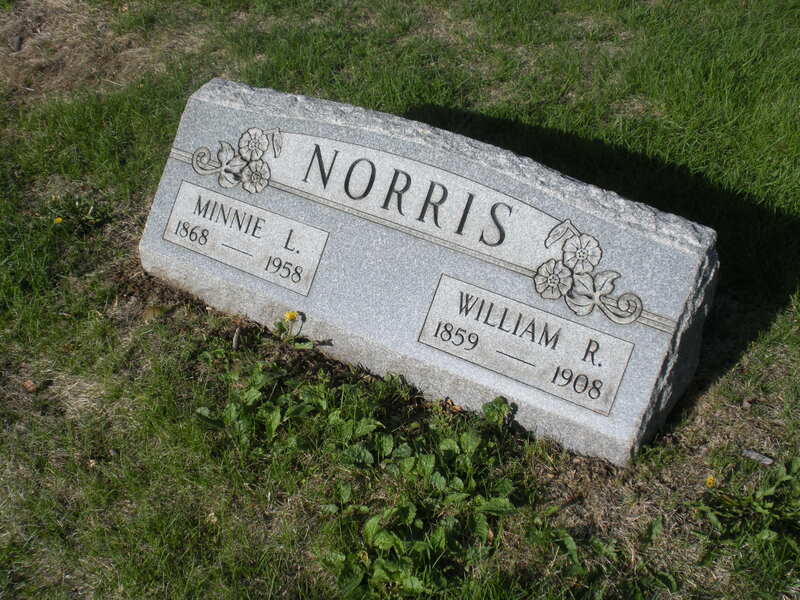 Norris was, in fact, my great-great-great grandfather. 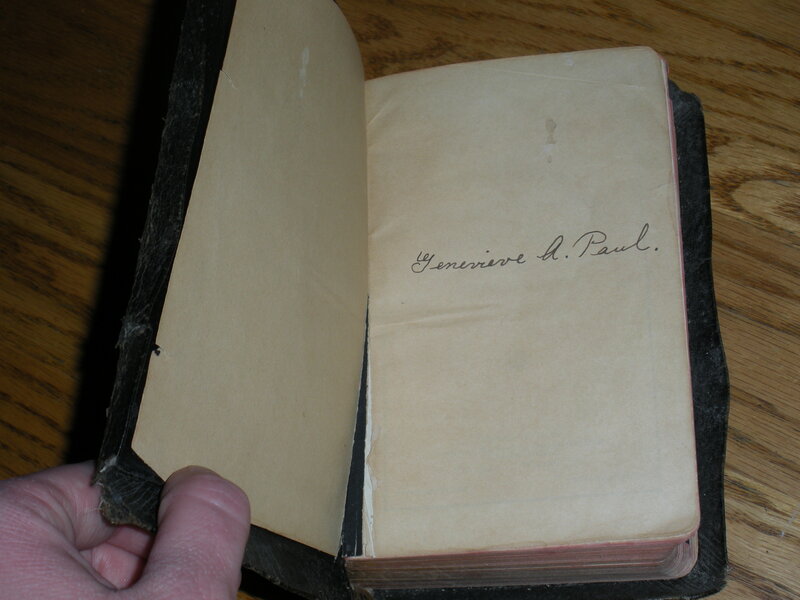 …there it is on the top of the page; Marion, AL. At the bottom of this page, you’ll see A.B. 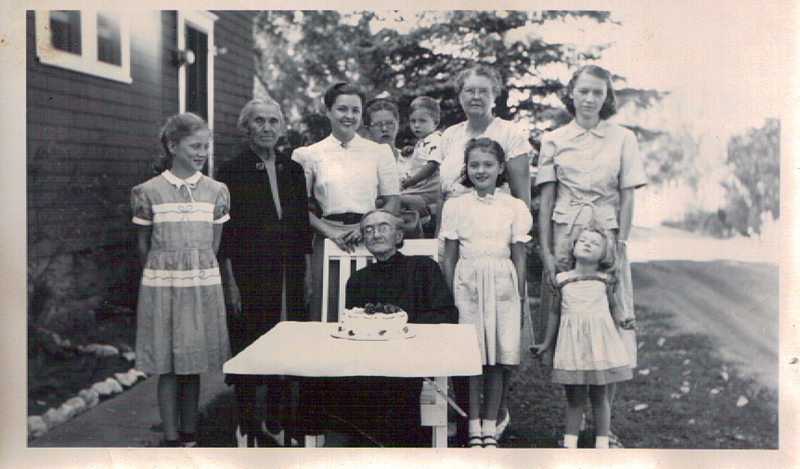 Norris, his wife, and several children listed. At the top of the next page, you’ll see William, age 1. One mystery solved. Many, many more to go. Oh, and something VERY exciting (in addition to the Bible pictures) in my next post! I decided to spend the late afternoon/early evening of the 2011 rapture (heh) at the graveyard. More of a coincidence than a morbid plan on my part, though I do find the timing amusing (hence, the prior heh). Needless to say, I am still here, thus able to post my findings from the cemetery. My mission seemed simple. 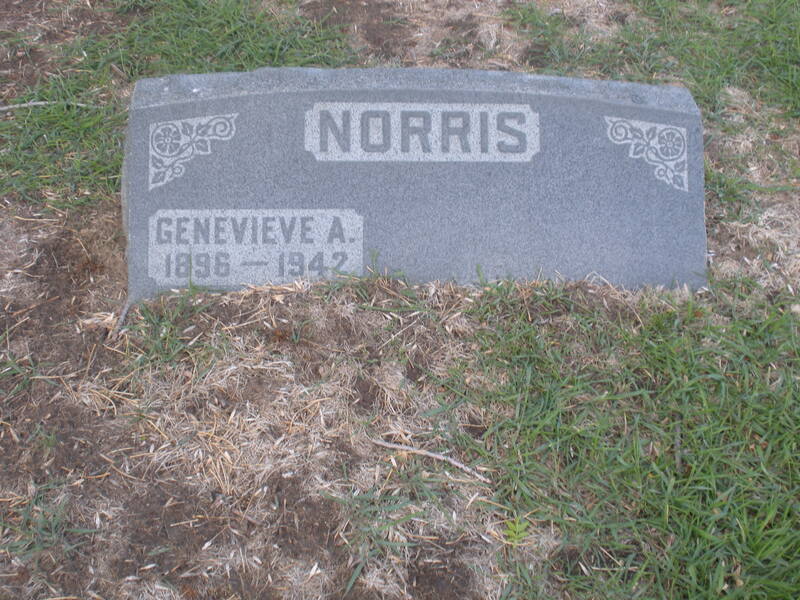 I had three tombstones to find; Genevieve Norris (my great-grandmother), Genevieve Paul (my great-great grandmother, mother of Genevieve Norris), and the shared burial site of Minnie Lee Norris and William Robert Norris. 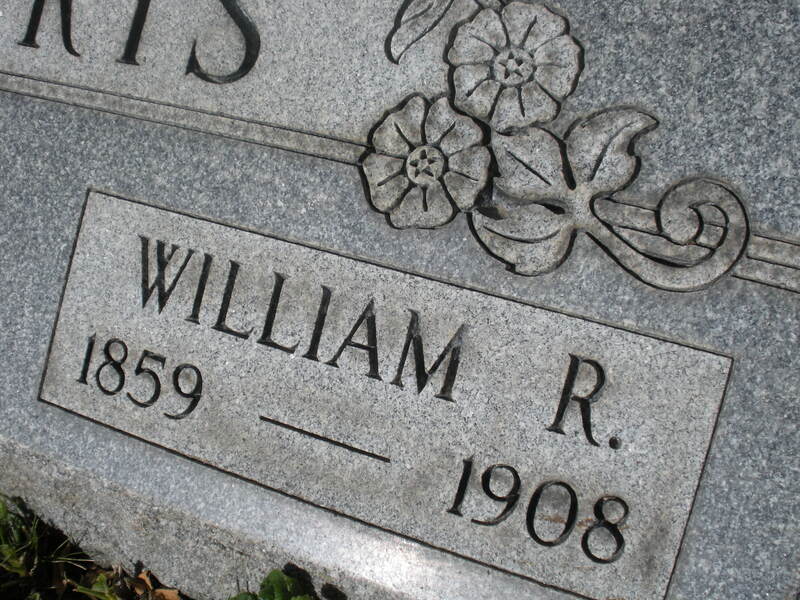 Lesson number one in tombstone searching: Don’t leave home without the location of the stones. Sometimes our trusty smart phones, aren’t nearly as trusty as one would hope. In this instance my “smart” phone decided not to search the cemetery’s website. Luckily, I could access the other tombstone database that I’d used to find info. about their burials. Sadly, T-237 and T-60, were rather mysterious descriptions. There was no section T on the map, and if they were buried in 237 and 60, then the next big question was…WHERE? There was no plot number listed. After a quick text to mom to see if she could access the cemetery’s website, she came back with the same results (well minus the mysTery T). I began to fear my whole trip would be a bust. The office was closed for the day, so there was no one to tell me what plot numbers my Norris relatives lie (lay?) beneath. I decided to take a meager attempt at wandering about randomly (once even counting the rows up to what might’ve been row “T”). Just as I had decided my day of reckoning should’ve been spent elsewhere, and right after I pulled my car along the side of section 237 to do a drive-by search, I spotted her. My next hope was that Genevieve Paul, her mother, was nearby. No such luck. I proceeded with my random search, in hopes that her tombstone would magically appear to me just as my great-grandmother’s had. I really don’t know how I lucked out, but I did. Three or four rows away, I found this beautiful stone. 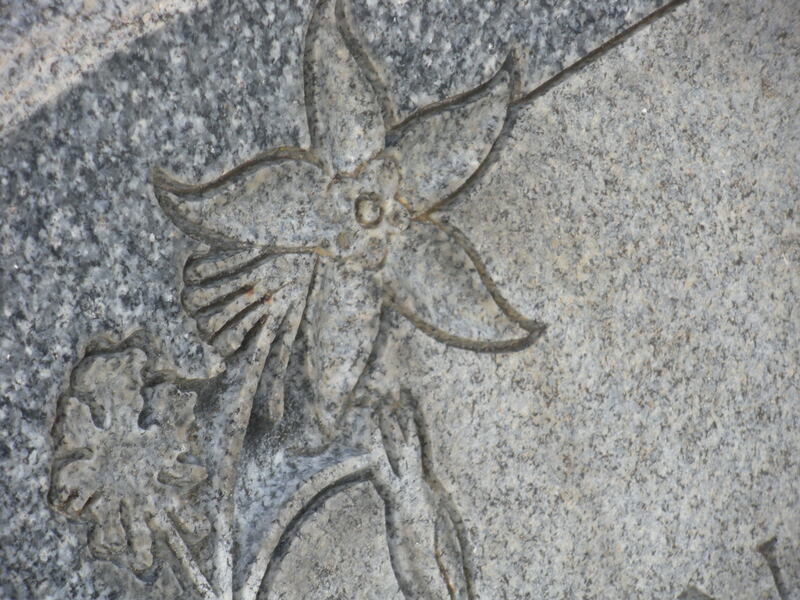 Check out the columbines carved on it. Feeling rather smug, but mostly just lucky, I ventured to section 60 of the cemetery, where I hoped to find the burial site of Minnie L. Norris and William R. Norris (my great-great grandparents). My guess was that good luck wouldn’t strike three times, plus I had to pee. I found the section, pulled my car to the side, and started to walk toward the graves (debating in my head where to begin, and how long I could search before driving two miles down the road to the nearest gas station bathroom). I hadn’t even gotten across the street to start my search, when my eyes were directed right toward their gravestone. The sunlight beamed down upon it, lighting it up, and literally drawing me right toward it. It was as if Minnie herself saw me coming, and said, “Look! Right here! Here I am! Here I am!” You probably think I’m exaggerating, but I really couldn’t have made this up (okay, I could’ve, but I didn’t). It was so fantastic that I’m quite certain I breathed an, “Oh my goodness No way!” out loud immediately. You can even see the remnants of the sun-shimmer on the stone in this picture. (If you really think about it). I was so happy to find them; in the very first plot in section 60. Gravesites are strange. There’s this aura about them that makes you want to reach out to the people buried there, and yet at the same time they are just stones…and well…bones. I was amazed at how beautifully preserved all three of the gravestones I found were, of course the oldest one was only from 1942, but still… I think in my mind I expected something strange, fading, and distant, when in reality they were clear,strong, and present. Minnie and William and the Genevieves were right there in front of me, and didn’t feel like they’d been gone nearly as long as they have. I never knew any of them, but I touched each of their stones, and told them how much I would’ve loved them. They were, of course, the people who brought me my Grandpa, my mom, and my aunt. They were just as wonderful. I know it. After spending several weeks on the Hastings side of our tree, I decided to switch gears and see if I could trace back my mom’s side (Norris) the same number of branches as I had the Hastings. After knowing for sure that I’ve gone back to my great-great-great-grandfather Hastings (and as you will soon find out, probably my great-great-great-great-grandfather— that’s a lot of greats), my next step will be to get to my great-great-great-grandfather Norris. Once you say great that many times, it no longer looks like a word. Try it! Starting out, the only Norris’ I knew the names of besides my own grandparents were my great-grandfather and grandmother and his mother (my great-grandmother Norris). 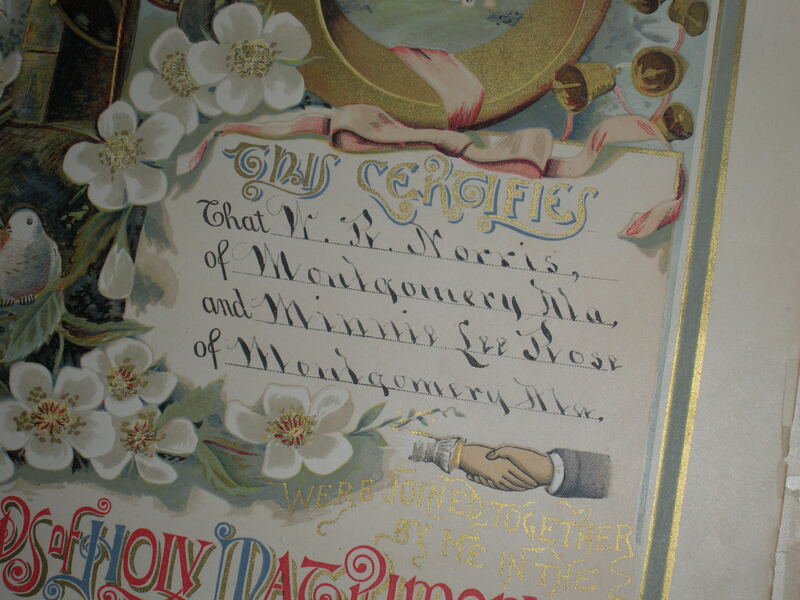 Samuel Ernest Norris, known as “Doc,” for he was a dentist was married to Genevieve Paul Norris. 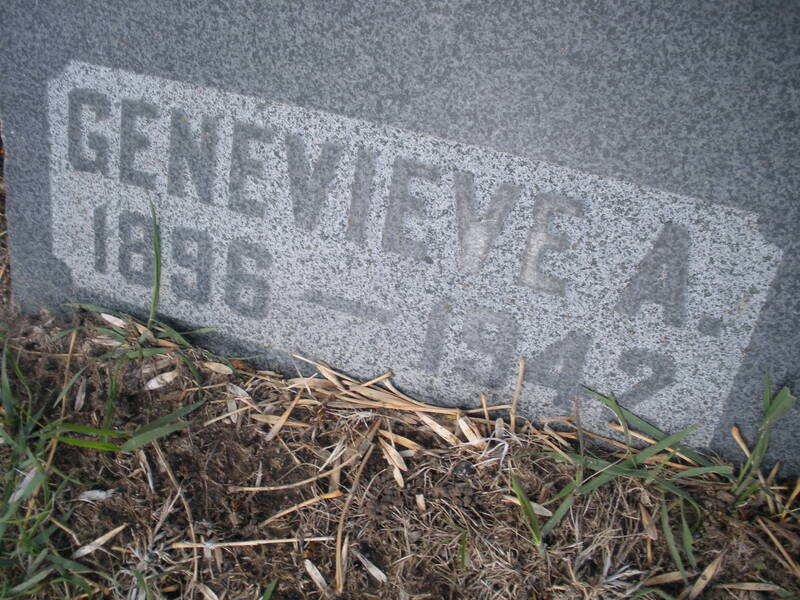 Genevieve’s mother, incidentally, was also named Genevieve, and oddly enough my Grandma Hastings is ALSO a Genevieve. There have not been any Genevieve’s since. Doc is my great-grandfather and, as I’ve been told, came to Colorado when he was quite young. His mother, Minnie Lee Rose, my great-great-grandmother was from Alabama and lived at one point on a place called The Rose Plantation. This is really all I know. 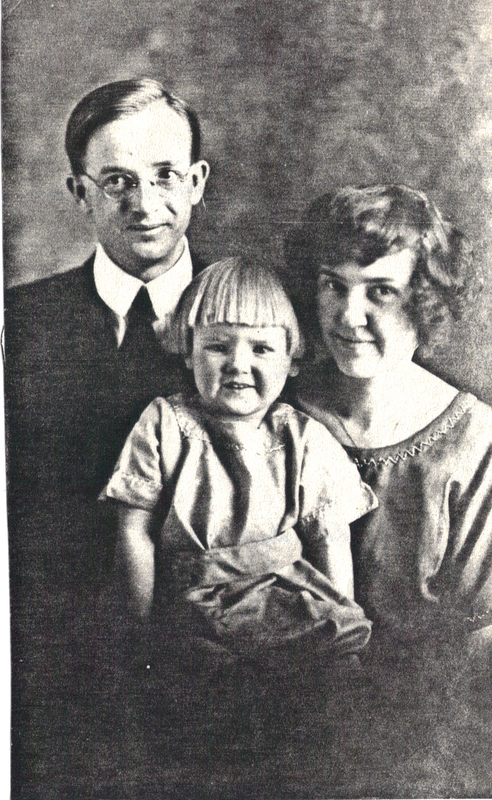 Below is a photo of Doc, Genevieve, and my Grandpa as a boy. In doing some census research, I first found a 24-year-old Doc (listed as Ernest instead of Samuel), a 23-year-old Genevieve, and my Grandpa who wasn’t even a year old in the 1920 census living with Genevieve’s mother, Genevieve Paul, 53. Genevieve Paul has listed her profession as seamstress, though I know she was also a very talented painter. Doc is listed as a dentist. Click on the census record to make it larger. 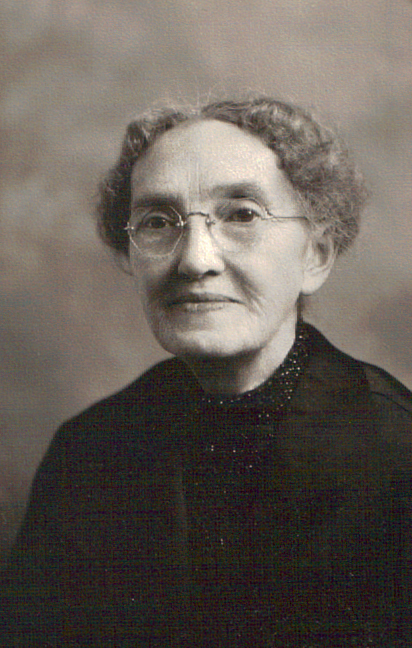 Incidentally, Minnie Lee Rose Norris, 51, was also on the 1920 census for El Paso County, Colorado. 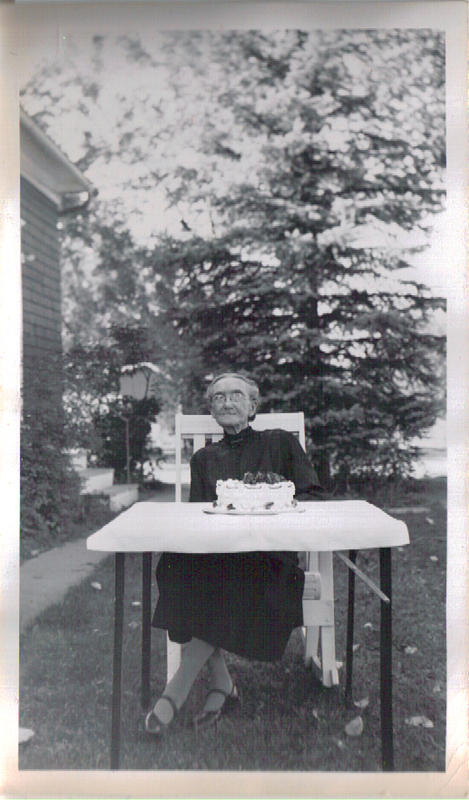 She was living by herself at this point, leaving me no clues as to the name of my great-great-grandpa. Click on the record to make it larger. Next, I tried looking forward to the 1930 census to see if I could find my great-grandpa and my grandpa in the house I know he lived in most of his life. However, though the 1930 census has been released, it seems as if Heritage Quest, where I’ve been doing my research (for now), doesn’t have the census roll I need digitized just yet. I’ll find them eventually, but for now, let’s go back farther. By searching for “Norris” in the 1910 census, I found a listing for Minnie L. Here, at age 41, she’s listed as the head of household and has three sons living with her. My great grandpa, Samuel (Doc), at age 15 seems to have been working for a florist at a greenhouse and his brothers William and Elmer were working as a clerk at a real estate office and salesman for (well I can’t read it, but it looks like cooking utensils) respectively. 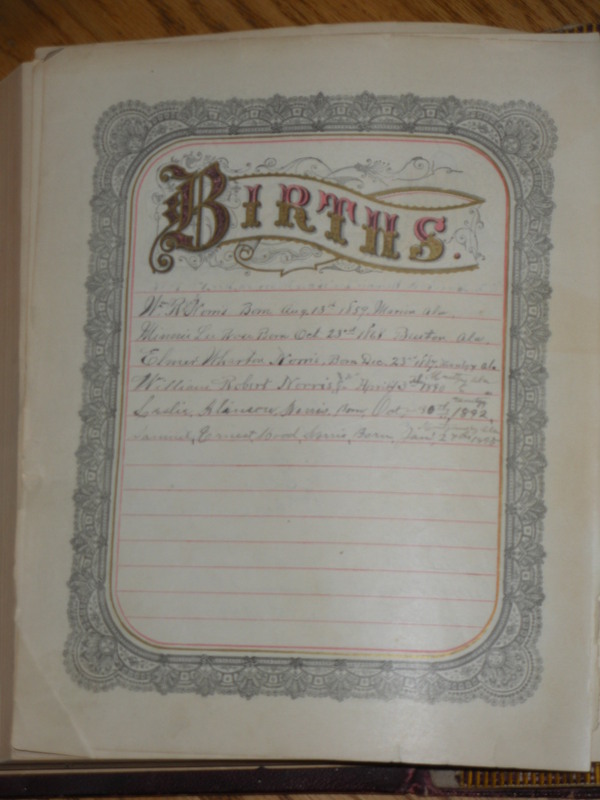 All of the boys and their mother are shown to have been born in Alabama. Her mother is also shown to be born in Alabama, while her father was born in Mississippi. Click on the census record to make it larger. So… At this point I’m thinking this is all REALLY cool, but where is great, great-grandfather Norris? I don’t even know his name! 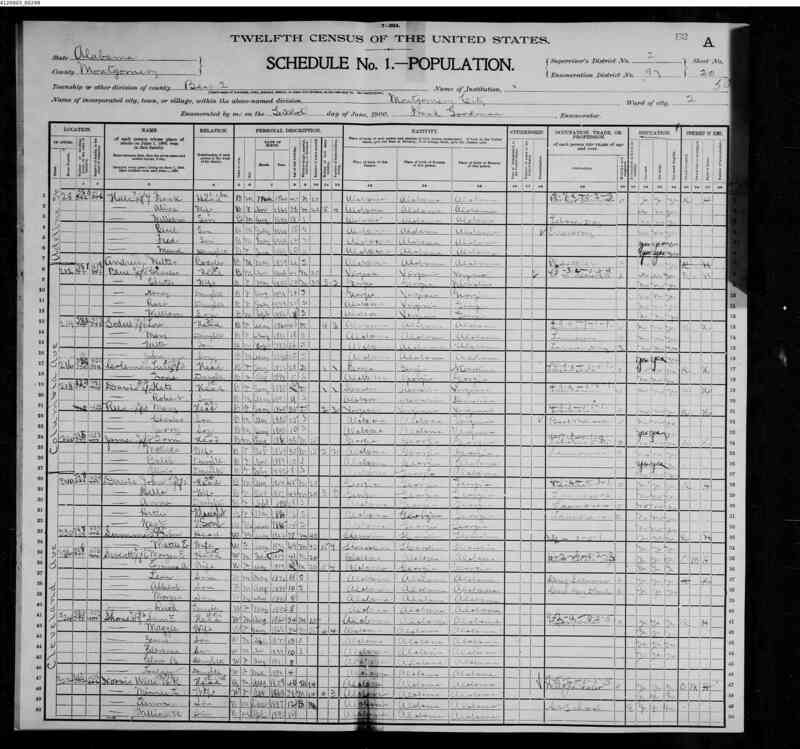 I try the 1900 census for El Paso County, Colorado. There is no sign of them in Colorado in 1900. Shoot! At this point, I have two ideas. 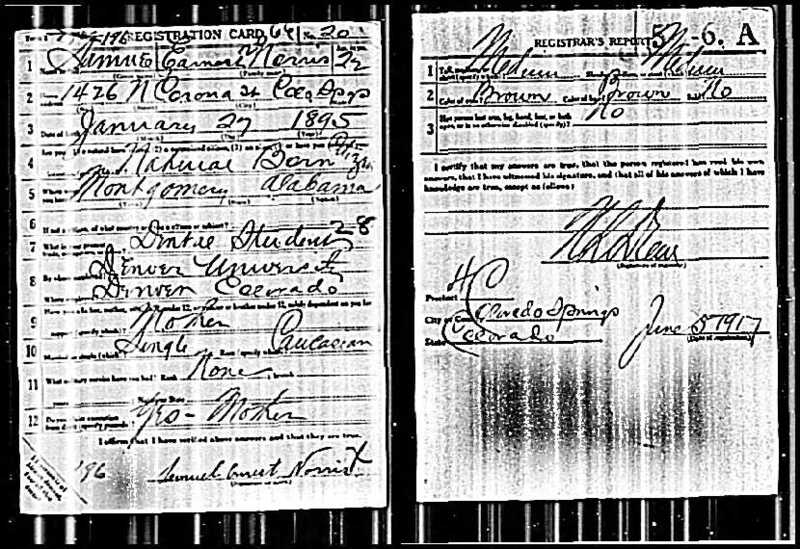 I can either begin searching for them in 1900 in Alabama in hopes that they moved straight from Alabama to Colorado OR I can try looking for obituaries and cemetery records in Colorado Springs in hopes that Minnie L. Norris’ husband is listed somewhere in one of those. First, I try finding her obituary in Pikes Peak Newsfinder, which is a really cool database available from the Pikes Peak Library District’s site. 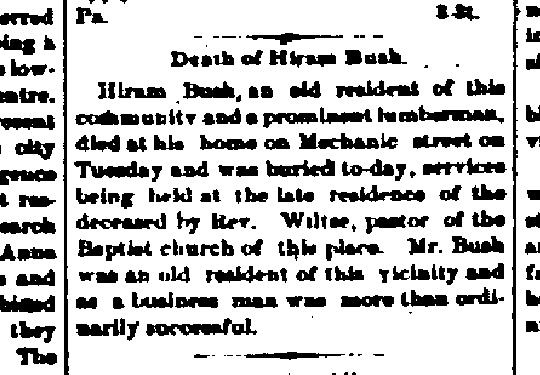 There are tons of local articles and obituaries digitized. Unfortunately, Minnie’s isn’t one of them. But then, I’d never heard whether she was buried here, so it was a long shot anyway. Afterall, I couldn’t trace her past 1920, and she was only 51 then. She could’ve been anywhere when she died. I decided to search the Colorado Springs cemetery records, though, on the off-chance that she stayed in Colorado Springs. By going to the cemetery records at this site: http://www.springsgov.com/cemetery/DesktopDefault.aspx?tabindex=1&tabid=2,I was able to search for Minnie Norris and BINGO! I found her. 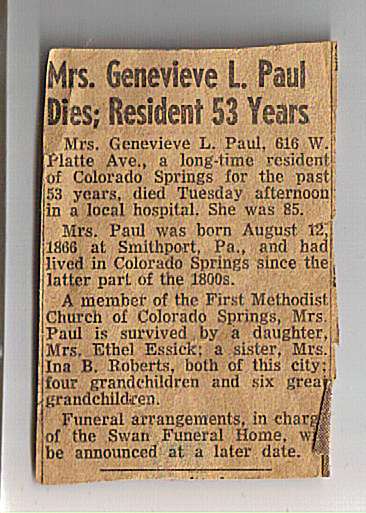 According to the cemetery record she was buried 12/30/1958, making her about 87 years old when she died. 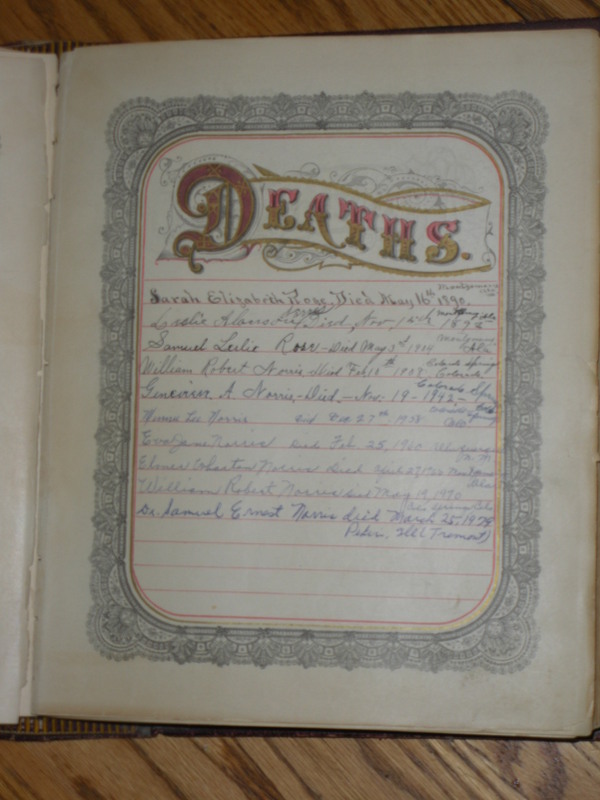 This record, however, just directs you to the grave itself and offers key birth, death, and burial dates (though in Minnie’s case the record only had a burial date). There were still no clues as to who my great-great-grandfather was. Perhaps he never made it to Colorado? I decided to try one more thing before checking the Alabama census’ or making a trip to a microfilm station to find Minnie’s obituary. In many cases, there are people who go out with the sole purpose of transcribing gravestones and going to the arduous task of typing them out and posting them online. From what I understand it is both to preserve what they say on them before the stones become hard to read, and also a means of sharing them for genealogists who aren’t near the stones to read them in person. This is a cool site I found that has links to many different transcription sites as well as official cemetery records. http://www.deathindexes.com/colorado/index.html. By clicking on El Paso County Cemetaries from the Colorado Tombstone Transcription Project, I was directed to this site: http://usgwtombstones.org/colorado/elpaso.html which allows you to search by cemetery and date. By looking in the cemetery book from 1972, and scrolling down to Norris, I easily found this entry for Minnie L. Norris. 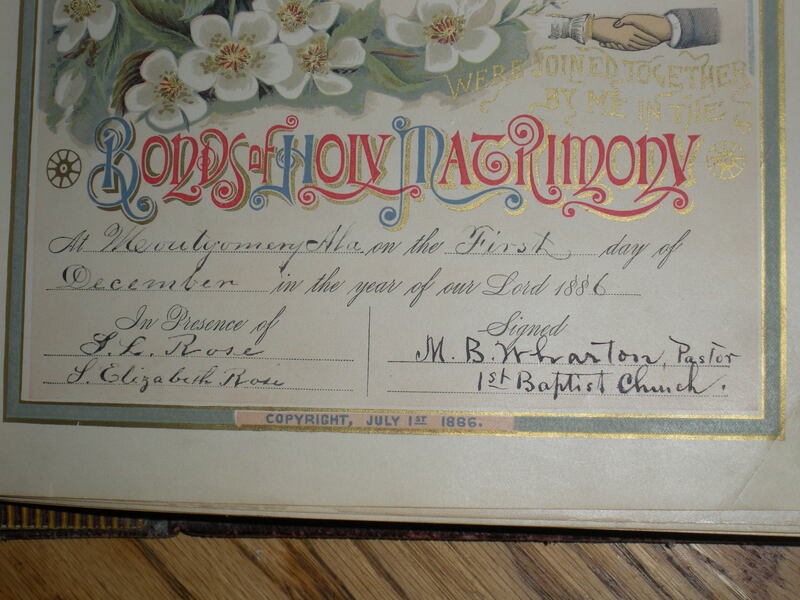 As you can tell, William Robert Norris died in 1908, according to this transcription. 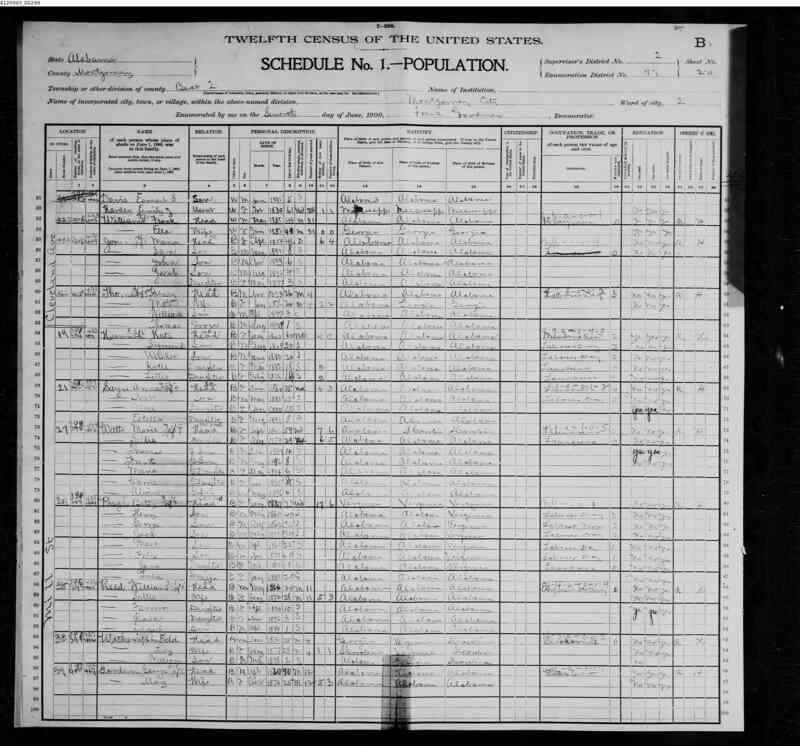 This would explain why he didn’t appear in the 1910 census, which could be the first census record for the Norris’ in Colorado. Clearly, they moved here before then, though, since we now have him buried in Colorado Springs in 1908. After finding these transcriptions, of course I want to go find the gravestones for myself. I had no idea my great-great-grandmother and grandfather Norris were buried here. 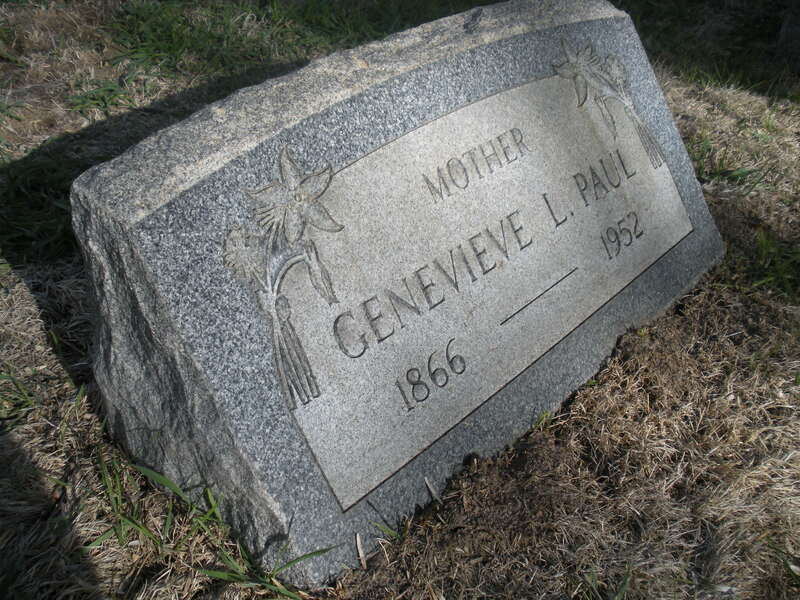 I knew that my great-grandmother, Genevieve Norris, and her mother, Genevieve Paul, were buried here, and I’ve been meaning to find their stones. Now, it seems I have a surplus of tombstones to find, and this, I believe will be my next mission.